SHOWING THEIR METTLE - Silson Joggers Michael Rapson and Alfie Long are all smiles after completing the Junior IronRun. Emily Waugh’s dominance of The Rugby Six continued as she crossed the line first for the fourth consecutive year to lead Rugby & Northampton to victory in the second race of the East Midlands Grand Prix. Waugh retained the title which she has owned since 2013 by winning the ladies race in 37 minutes and 31 seconds, over a minute quicker than her nearest competition. Next over the line for R&N was Vicky Nealon (40:24) in fifth place while Angela Copson secured 12th spot in 43:22. Copson’s fine performance saw her clinch the F65 title; the perfect preparation for her first European Masters 10k Road Championships appearance which takes place in Portugal on May 20. One place further back in 13th was Lorna Latimer (44:25) while the team was completed by Kate Williams (46:52) and Helen Jones (47:28) in 22nd and 26th respectively in the overall standings. Williams’ time was also enough for second place in the F55 category and Jones’ clinched sixth amongst the F45. R&N made it a double when the Senior Men took first place and were led home by Stephen Marks (33:49) in sixth to add his name to the Tony Hetherington Memorial Trophy for the highest finishing R&N athlete. Daniel Mould finished seventh in 34:16 and he was followed by two club veterans, with Paul Birch (35:58) clinching 16th spot overall and third in the M40 competition, while Brendan Moen (36:16) finished fifth in the M45 and 19th in the race. Three seconds and one place behind Moen was Daniel Williams and chasing him home was the first under-20 man, Joseph Childs, with a superb run of 36:34 to take 21st. The Veteran Men’s team finished in second place and joining Birch and Moen in the squad were Terry Egan in 29th overall on 37:05 – which placed him second in the M55 – and Nigel Roberts (38:08) who finished 10th in the M45 and 40th overall. A total of 19 Silson Joggers runners took part in round two of the EMGP Series – the Rugby 6 - last week. Claire Corcoran and Jo Japp, who came third in the F35 category, both made their first EMGP runs for Silson, while Amy Jelley and Eleanor Rees both ran their first senior 10K road race, finishing in third and fourth place respectively in the F20 category. James Darcy came second in the M50 category, Sue Torrance was second in the F50 category, Tim Hullet came sixth in the M65 category and Stewart Shears managed to gain a new 10K PB with his tremendous time of 39:49. 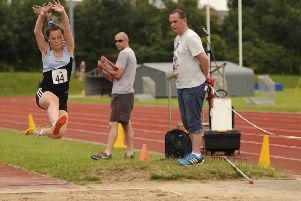 Heidi Biltcliffe-Gray competed at the Buckinghamshire County Championships, held in Oxford on Saturday. She gained a new PB in her 200m heat and qualified for the final where she finished in a fantastic fifth place. Biltcliffe-Gray also put in a strong performance in the 800m race, too. The Northamptonshire County Championships took place last weekend and Silson juniors Abbie Burnett, Alfie Pace, Amber Salkeld, Archie Tattersall, Bella Taylor, Caitlin Neall-Johnston, Cara Mannix, Emily Hinton, Georgia Corcoran, James Darby, Jedan Stewart, Katy Mannix, Liam Cowley and Mia Cowley all took part. They all gave everything they had and represented themselves and the club spectacularly. To top off their fine efforts, Katy Mannix won gold in the U13 800m and silver in the U13 1500m. Georgia Corcoran won silver in the U13 70m hurdles and bronze in the U13 high jump. Amber Salkeld won silver in the U11 75m and bronze in the U11 150m, taking two seconds off her PB and setting a new Silson club record. While the road runners in the club are relieved that cross country season has finished, there are lots of the Joggers who miss the mud. This was evident on Saturday at the IronRun Junior event, where seven Silson juniors (Alfie Long, Eleanor Rees, Holly Rees, Lucy King, Michael Rapson, Millie Rees and Rebecca Lytollis) had a fabulous time. Long and Rapson powered their way round the 3K wet and muddy obstacle course and finished in first and second places in their wave. Father and daughter team, Paul and Chelsey Rose, both gained new parkrun PB’s at the Buckingham parkrun on Saturday. Chelsey is absolutely flying at the moment as this is her third PB in four weeks. Marie Wray also gained a new PB at the Milton Keynes parkrun. Michael Spencer ran a very warm Marathon at the Broadmeadows Runs Church Lench event on Sunday. The course was mainly off road, covering lots of fields, woods, bridleways and paths, and a few hills thrown in for variety. Spencer finished third out of a field of more than 20 runners with a cracking time of just under 4:10. He received a prize of cider, wine and trail socks for his efforts. Caroline Mackenzie, Julie Long and Sally Stephens had an absolute ball running a brand new 10K trail race near Luton.